Jim Carstens lettered on the 1970 and '71 National Championship teams. He was a backup fullback and played on the kick-off and kick-off return special teams. This interview was done on June 23, 2004 by David Max. Here is a link with some photos of Jim. DM Where are you from originally? JC I was born in Chicago and raised in Forest Park and Glen Ellyn and attended high school at Fenwick in Oak Park. Outside of prep school and college I have spent my entire life in the Chicago area. DM Who recruited you to Nebraska? JC It's actually a little complicated. In my case I graduated from high school in 1967, but George Kelly and Jim Ross recruited me that fall. I was in Washington, D.C. attending Columbian Prep, which was a preparatory school for the United States Naval Academy. I was there because my class rank in high school was a problem. Fenwick High School had very high academic standards. 100% of my graduating class went to college and a huge percentage of them on scholarship. Anyway, I was one of the guys that helped create what we call the upper half of my class. (Laughs) My class standing was low enough that even though I had a successful high school football career, I didn't get a lot of looks from major colleges and universities. I spent the summer of '67 at Southern Illinois University in Carbondale taking three classes and trying to get my grade point average up. On my father's advice, I ended up at the prep school in Washington, D.C. for the school year of '67 -'68 and that's where I got the nod from George Kelly. Actually, George was at Fenwick in the fall of '67 recruiting a player named Dominic Mancini (who ended up at UCLA) when my former coach, Len Tyrrell, put in a good word for me. That was a wonderful break for me. George contacted me and Jim Ross followed up and came to my home. The rest, as they say, is history. DM Did you do any other recruiting visits? JC The only other recruiting visit I did was out of high school and I visited Southern Illinois University at Carbondale. DM Who was your position coach and what was he like? JC That's a very interesting question because numerous coaches worked with me. As a fullback, my primary coach was Mike Corgan. He was quite a character; a no-nonsense guy. He was filled with great conviction and would accept nothing less than your best. You either did the job or moved on. He was really something. Like other scout team members, I worked with numerous coaches. In addition to our rostered positions, we would be asked to serve other needs. I was with Monte Kiffin, Bill Thornton, John Melton and Warren Powers on the scout teams, and with Monte Kiffin, Cletus Fischer and Jim Walden on special teams. Tom Osborne worked with the fullbacks when we were developing and practicing our passing game. So, like many others, I had the opportunity to be mentored by a number of really talented coaches. DM When you worked with the scout squad what was it like practicing against all of these future All Americans? JC In hindsight, it was a gift. We didn't understand at the time who these guys were going to become. We all started out in the same boat and the guys that eventually became All Americans were sometimes not the guys that appeared to be headed in that direction as underclassmen. There was a lot of talent out there on the field, including a number of All American quality players who remained "unrecognized" due to limits of the selection process. That's not to take anything away from the players who received the title; they worked hard, made the most of their opportunities and every one of them deserved the honor. DM You were roommates with fellow Chicago native Doug Dumler for three years. Did you guys know each other ahead of time? JC We didn't know each other before arriving at Nebraska but for some reason Doug, who we affectionately referred to as the "Goose", and I just clicked. We were very opposite in some ways and very alike in others. Doug was a very dedicated student. He was practical. He was very slow to anger and almost always the voice of reason. Conversely, I was not a very good student and generally more spontaneous and mercurial. We complimented one another. And also of note was the fact that we were both neat and organized about our possessions and living area. That is not generally the norm for 20-year-old men living in a dormitory situation. DM So you lived in the dorms all three years? JC For the four years I was at Nebraska, I always lived in the dorms during the school year. My freshman year I roomed first with, Greg Stejskal and then with Jeff Hughes. Doug & I roomed together for the next three years. DM Do you have any good practice stories? JC There are many, many but a couple good ones come to mind. I can remember helping the team prepare for the Southern California game in 1969, our season opener. Under the leadership of our great scout team quarterback, Chuck Osberg, we made a mistake. We marched down the field 80 yards in about 12 plays upsetting the Blackshirts. I want to tell you something. That may have been biggest single mistake we ever made as members of that scout team. The defensive coaches were furious. We turned around to go back and inspired by their coaches wrath, the Blackshirts crushed us - again and again. You have no idea how long two hours can seem when you're facing the likes of Mike Wynn, Adrian Fiala, Ken Geddes, Bob Liggett, Al Larson, Dave Walline, Sherwin Jarmon, Dan Kobza, Jerry Murtaugh, Randy Reeves, Jim Anderson and Larry Jacobson. Another practice memory is more personal. At one time I was a member of both the Number 1 and Number 2 kickoff and kickoff return teams. On this particular day Coach Kiffin and Coach Fischer wanted both the kickoff and kickoff return teams on the field at the same time. I lined up with the kickoff team and Coach Kiffin was at the other end of the field yelling and screaming my name frantically because I was missing from the return team lineup. The same scenario played out twice with the Number 1 & Number 2 teams. It was becoming sort of funny and the guys were getting quite a kick out of the situation. Finally, Coach Kiffin threw his hat down and said "That's it. I'm making you the official captain of the kickoff teams!" It was a pretty big moment for me. DM How does it feel to be fortunate enough to play two years at Nebraska and get two National Championships? JC Well, I'll tell you what and Dave, it's something that I think about almost every day. That may sound kind of strange but, particularly since the Husker Nation reunion last fall, I just feel so blessed to have been a part of that era. The friendships that were developed with the players and the coaches are just so fantastic. Accurately describing how special all those memories are to me is beyond my capacity. DM Is there a particular regular season game that sticks out in your memory? JC Well, actually there were two. In our first road game of the 1970 season we were playing Southern California in a night game in the Coliseum. The "Trojan" was riding his white horse around the stadium and the atmosphere was unbelievable. The Southern California linebacker was Greg Slough, number 53, a highly touted preseason All American. I can remember getting together and talking with Danny Schneiss and Slough was our target for the day. If we could stop this kid we could move the ball. At one point Danny came off the field with the front of his jersey bloodied. For the briefest moment I thought, "I'm going to get in this game and it's going to be so fantastic." I looked at him and said "Are you all right'" He replied, "Do you mean this? This isn't mine. It belongs to Greg Slough." Another memory is against the University of Colorado in Boulder in a widely televised game during the 1970 football season. In the first quarter Guy Ingles was the recipient of two Van Brownson touchdown passes. Following the first of these touchdowns, Danny Schneiss came out of the game for a few minutes because he got what we refer to as a "stinger." That gave me the opportunity to be in the game when Van Brownson hit Ingles with the second pass. That was the only time during that game that I was on the field with the first team and it was a real thrill that a touchdown was scored at that moment. DM Do you have any particular "in the huddle" stories? JC Yes, I do. Again, in the '70 season we were playing Kansas State at home. It was late in the game and Dave Morock intercepted a pass and returned it for a touchdown. That put Nebraska ahead 51-13 and gave players who didn't see a lot of game time the opportunity to participate. Van Brownson was injured and didn't start that game, but he did come in for a time late in the game. I got in the huddle and Van (who usually marched to his own drummer) ignored the instruction sent in by Coach Devaney and said "We're going to get Earth into the end zone." I think we were inside the 15 and he called my number three plays straight. On fourth down, ignoring Coach Devaney's strict orders, he put the ball in the air. It was a fullback swing sharp. I caught the ball but unfortunately I was immediately racked up at the goal line and didn't get in. So, I didn't get the touchdown, but it was such a thrill for me that Van and the rest of my teammates were willing to try to make it happen. DM Do you have a favorite Bob Devaney story? JC There are numerous stories. The thing about Bob Devaney that was so special to me was that Bob was real. His team was extremely important to him. No one person was greater than the team and he made that perfectly clear. He would ask you to perform a role or a responsibility and when you did it he was appreciative. I have a souvenir that I'm not sure anyone else would remember. Following the occasion of his 100 collegiate win, Coach Devaney was given a cake one afternoon after we watched films. When they were cutting up and serving the cake I thought to myself "You know what, that little plastic quarterback will be worth some memories someday." I figured nobody would miss it and it kind of ended up in my pocket. I still have it to this day. Another story took place back in 1996. I went back to Nebraska for what was supposed to be a celebration of the back to back National Champions of 1970-71 and 1994-95. Unfortunately it was saddened with the unforeseen death of Brook Berringer. Some of the events were cancelled and others were not. At a gathering on Friday night before the Spring Game, Coach Devaney was present and my son was with me. Coach Devaney's attention was in great demand and I was just hoping to get an opportunity for my son to meet him. He not only met Jim, who was 19 at the time, he shared some stories with my him. He was so generous and kind. It was just a moment that I will never forget and neither will my son. He said "Let's just move over here Jim. I'd like to talk with your son." It was very special. DM Do you have a favorite Tom Osborne story? JC I think Bob Terrio may have stolen some of my thunder on that one. I had an experience with Coach Osborne similar to that of Bob and Danny Schneiss. My partner in crime was Paul Rogers. If your grades were of a certain lackluster level (laughs) Coach Osborne required you to attend a regular evening study hall at training table Monday through Friday. The proctor was a wonderful lady, Mrs. Hagge. One day Paul and I decided that whatever it was that we were doing didn't allow time for study hall. The following day we were notified by the coach that he would meet us the next morning at 5 AM, not 6 AM as in Bob and Danny's case, at the indoor track at the field house. It was still dark outside and just being up that early was a shock to my system. Paul and I showed up and sure enough there was Coach Osborne. Just as we began to run our 5 mile penance, Coach was right behind me and said, "Earthquake, if I pass you, we're going to run it again." It was quite an experience. Five miles was enough. The threat of repeating insured that he never passed either one of us. I will tell you something else about Coach Osborne that I think was just a magnificent experience. When we returned to Nebraska last September for the Husker Nation reunion, Coach Osborne addressed us prior to the Oklahoma State game. He startled us when he said that he had learned from us. He realized that as young men we each came to Nebraska wondering, "What can Nebraska do for me?" But as time passed and our characters developed, we realized that we could not all be starters. At that point we each changed and accepted the new challenges and said to ourselves, "What can I do for Nebraska?" That he recognized this and was willing to acknowledge it was a very positive affirmation. You wouldn't believe how many heads turned to the person next to them and just nodded in agreement. The fact that he realized that and was willing to accept and share it with us it meant so much. DM What was your best bowl game memory? JC I had the opportunity to go to three bowl games and have memories of each of them. I was fortunate to be invited to travel with the team to the Sun Bowl during my redshirt year. I experienced the Orange Bowl twice, but the second, against Alabama, stands out in my mind. Those outside the team may not remember Rex Lowe. He was a teammate and two-time letterman who was suffering from Hodgkin's Disease. He was an extraordinary young man who suffered greatly but never complained. By the time of that game against the Crimson Tide, his health had greatly deteriorated but he was still there to encourage us. By an unspoken agreement we all knew that Rex deserved the game ball. It was a moving experience for me that I will never forget when Johnny Rodgers presented him with the game ball. In Memorial Stadium, among all the trophies, there is an oil painting with a plaque that reads something like "Rex Lowe, Inspired the National Champions of '70 and '71." He so graciously did. DM Do you still stay in touch with Nebraska Teammates? JC Prior to the Husker Nation Reunion, I touched base a couple of times a year with Bill Janssen, Doug Dumler and Jeff Hughes. Since then I've had the opportunity to reestablish contact and catch up with a lot of the guys. Using e-mail, I now stay in touch with Mike Beran, Tony Davis, Dave Goeller, John Hyland, Bob Newton, Tom Ruud, Bill Sloey, David Humm, Carl Johnson, John Decker and others. I also touch base frequently with Dennis Morrison, who was our freshman backfield coach and a great tight end at Nebraska during the mid-sixties. DM What are you doing now? JC I'm back in Illinois. I'm married to my college sweetheart and have been for over 30 years. My Annie. She's fantastic. She was from Greeley, CO and we met at a night class. Mr. Gelwicks' History class. I have a son and a daughter. Both are grown and fortunately are successful on their own. I've worked in the fire service for nearly 24 years and have been a lieutenant for the City of Wheaton for the past 10. I'm currently recovering from a work related injury and hope to be back to work soon. People that knew me back at Nebraska might remember that I had a passion for Harley Davidson motorcycles. I still do. I currently own a 1995 FLHR/Road King. DM Bill Sloey told me a story about how you had one all taken apart in your dorm room. JC One year we stayed in Harper Hall for summer practice and I brought the bike up in the elevator and was driving it around on the fourth floor. 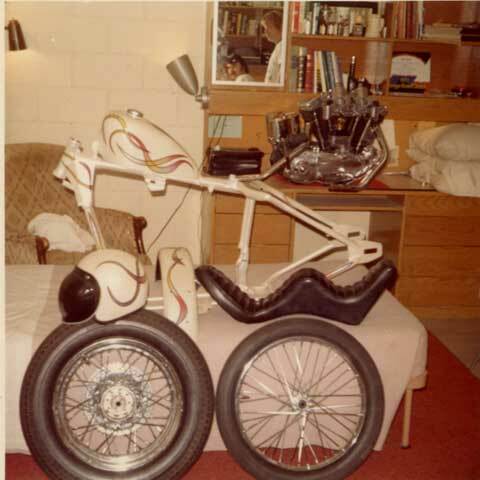 Another time I disassembled the whole bike and stored it in our room during the winter when Doug Dumler and I were roommates. DM How did you get the nickname "Earth?" JC My freshman year I was in the backfield with Van Brownson and Jeff Kinney and Jeff Hughes and Jerry List. I was considered pretty big to be a ball carrier at the time. One game, I was carrying the ball down the sidelines toward the field house, and a teammate, Milo Prisuta, swore that the field house began to shake and that I was the cause of an earthquake. Then it just got cut short to "Earth." DM Is there anything else about your playing days at Nebraska that you would like to comment about? JC Just that it was a privilege and a pleasure to be a part of those events. Players like me who generally participated only on the scout or special teams are probably not remembered by anyone but our teammates and the most ardent fans. There is that perceived absence of glory that makes people outside the program wonder why suicide squad guys stick around when there's a good possibility that some could go to smaller schools and be starters. It comes down to the old adage, the total is greater than the sum of the parts and to be any part of the Nebraska Football program during that era was a genuine blessing. In the recent movie Miracle, Kurt Russell, in the role as 1980 US Olympic Hockey Coach Herb Brooks, says at one point "I'm not looking for the best players, I'm looking for the right players." It's just my opinion but I think that's what happened during those years at Nebraska; the right players came together. No doubt some of the best players were involved and superior coaching was a factor, but there was a lot of timing and chemistry at play, too. I don't remember anyone saying it at the time but I think that everyone knew that there was something extraordinary going on. The chemistry between the team members, the friendships that were building, the unbelievable support of the fans and the state contributed to the accomplishments and the championships those teams were able to achieve. What we gained and took away with us was much greater than what we each contributed. Also, you can't neglect the participants that went before us. The coaches and the players that developed the program and set the stage for us. There's a list of All Americans that goes back to 1914 and players back to 1890. What an amazing legacy. Finally, I agree with Doug Dumlers' comments about how extraordinary it is to have had the opportunity to play football at Nebraska. There are only a few other places in this nation that generate the kind of magic that envelops Lincoln on game day. The fans are some of the best in the nation. I truly think it's a message that needs to be communicated to the people. They are not just bodies sitting in stadium seats, or downtown businesses supporting the team. They are a part of it. The records and the championships would never have been accomplished if it wasn't for the efforts and contributions made by the fans. To pack up on Saturday and come to support their team, some driving hundreds of miles. When I think about that I'm staggered by the degree of their loyalty. We need to remember that and appreciate them, every season, every game, every practice. DM Jim, thanks for sharing your Husker memories with us. This series of interviews is being done in conjunction with the Bob Terrio Classic on July 15th. Jim Carstens can be reached at this email.